This left facing ½ length miniature portrait shows the young Mrs Selina Tomlins (ca.1807-1835) at about 21 years of age. She wears a sky blue silk day dress with short, puffed sleeves (possibly with further puffs of silk or net continuing to the wrist) set low on the shoulder, either side of a wide lace-trimmed neckline, filled-in with a sheer white muslin chemisette-tucker with a ruffled lace collar, forming a V-neckline at the front and rising high behind the neck, in a modified revival of a 16th century Elizabethan-style standing ruff. Her face is framed by dark, glossy ringlets and she wears a ‘cornette’ (a bonnet-style day cap) of spotted muslin, its softly gathered crown trimmed with a blue ribbon and double-frilled brim, creating a highly sentimentalised appearance. A small gold brooch is pinned to the front of her smooth fitting bodice, belted with a striped ribbon at the moderately high waist and fastened with a rectangular gold buckle, drawn to one side. 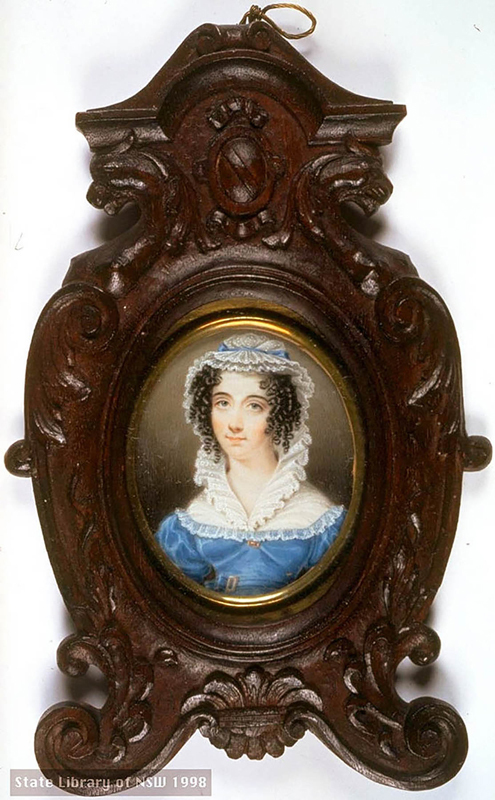 Richard Read’s simply conceived miniature portrait of Selina Tomlins, wife of Audit Office clerk, George Tomlins (ca.1803-1854) is focused on dress and personal presentation, and represents the growing class of free immigrants (she had arrived in Sydney in 1824) who were beginning to pour into the colony. Their world was urban rather than landed and their interests coincided more with emancipated convicts and the Australian-born lower and middle classes. Painted in 1828, by this date the classical taste in dress had given over to a more romantic spirit, encouraging a shift away from the vertical, columnar line to a more triangular silhouette achieved through a widening of the shoulder line and at the hem. Like all transitional phases, this period gave rise to some curious experimentations and novelties inspired by a range of revivalist styles. On card taped to back: ‘Painted by / R. Read, / 89 Pitt Street / Sydney / New South / Wales. 1828. / Mrs G. Tomlins’.